A new closer look at genomes in prostate cancer has revealed that genetic mutations occur in abrupt, periodic bursts, causing complex, large-scale reshuffling of DNA driving the development of the disease. “We believe chromoplexy occurs in the majority of prostate cancers, and these DNA shuffling events appear to simultaneously inactivate genes that could help protect against cancer,” said co-lead investigator Mark Rubin, MD, of Weill Cornell Medical College and New York-Presbyterian Hospital/Weill Cornell Medical Center, New York. “Knowing what actually happens over time to the genome in cancer may lead to more accurate diagnosis of disease and, hopefully, more effective treatment in the future,” said Dr. Rubin. 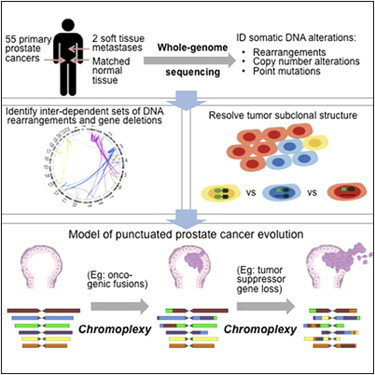 The discovery of “chromoplexy” came after the authors sequenced the entire genomes of 57 prostate tumors and compared those findings to sequences in matched normal tissue. This study sequenced 57 prostate cancer genomes as well as the entire genomes of matched normal tissue. Researchers revealed a large number of genetic alterations in the prostate cancer cells—356,136 base-pair mutations and 5,596 rearrangements that were absent from normal DNA. Of those rearrangements, 113 were validated by re-sequencing and other methods. Using advanced computer techniques that modeled the genomic rearrangements and copy number alterations, the authors inferred that the chromosomal disarray in a typical tumor might accumulate over a handful of discrete events during tumor development. “The rearrangement of chromosomes can coordinately affect specific genes, which provides a selective advantage for cancer growth,” Dr. Garraway said. Looks like targeted gene therapy will not happen in our lifetimes. Incredible advances though in the science since we all learned it. Glad I am retired! What happened to the “Four humors” which explained all disease? Would this suggest that if you are diagnosed with any prostate cancer, try to get rid of it right away – it might explode into something very serious over night? I doubt it. The mutation events probably occur over fairly long times and often before the diagnosis is made.